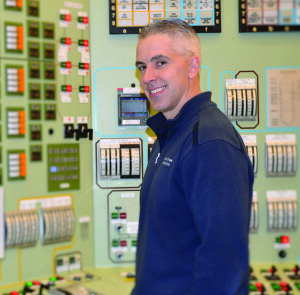 The control room simulator at the Oyster Creek Generating Station in Forked River, New Jersey, seems an appropriate setting in which to talk with Operations Director Mike Ford ’98 about the training required to keep a nuclear plant running safely. As its name implies, the simulator mirrors the actual control room elsewhere on the plant’s 800-acre site, down to every button, switch, knob, dial, gauge, and computer screen. (Even the carpeting is the same.) In here, says Ford, precision is at a premium. Cameras and microphones, used during training, ensure that operators communicate in unambiguous terms. An operator who needs to adjust one of the aforementioned buttons, knobs, or dials, for example, may do so only after conferring with a colleague and consulting one of the six-inch-thick instruction manuals kept in the room. “You can’t touch a switch without someone watching you,” says Ford. Operators must complete an 18-month training session before being granted a license by the federal Nuclear Regulatory Commission. Intense does not begin to describe the process of wrapping one’s head around so much highly technical information. What’s the experience like? “Like drinking water from a fire hydrant,” says Ford. Ford came to the plant, straight from TCNJ, as a chemistry technician, analyzing the water that flows through the reactor. (The CliffsNotes version of the plant’s operation goes something like this: The reactor’s 137 rods heat water to 520 degrees Fahrenheit, which produces steam, which spins a turbine, which makes electricity.) Several promotions later, in August 2012, Ford was named operations director. These days, he oversees a staff of 115 people and is responsible for the overall day-to-day operation of Oyster Creek’s nuclear reactor. The Oyster Creek Generating Station is America’s oldest operating commercial nuclear power plant. It began operation in December 1969, and today provides electricity to 600,000 people in New Jersey, Pennsylvania, and Maryland. 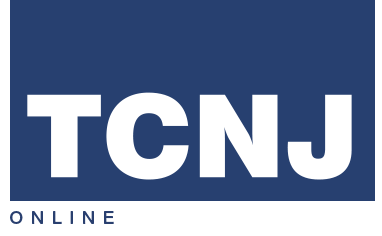 Its location in a densely populated region of the Jersey Shore—30 miles north of Atlantic City, 60 miles east of Philadelphia, 75 miles south of New York City, and within 50 miles of more than four million people—only underscores the need for its safe operation.